June 28, 2011, St Annes College, University of Oxford, U.K.
A workshop and seminar entitled "Building the Future Internet: The Social Nature of Technical Choices". 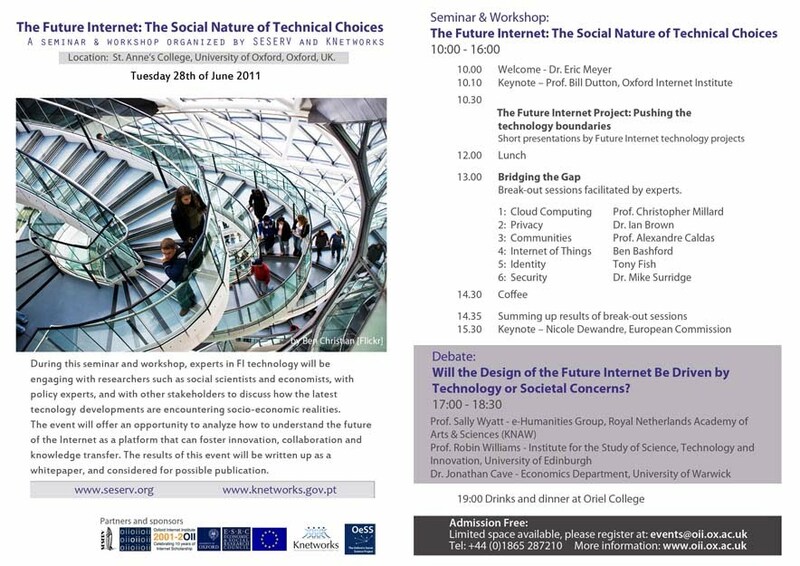 During this workshop and seminar, which will be held on June 28 from 10:00 to 16:00, experts in FI technology will be engaging with researchers such as social scientists and economists, with policy experts, and with other stakeholders to discuss how the latest technology developments are encountering socio-economic realities. Particular attention will be given to the methods and approaches that facilitate the creation of multidisciplinary networks of collaboration and knowledge exchange. The specific topics will be announced soon, and will be based on the results of the SESERV survey currently being circulated to FI projects about socio-economic issues relevant to the realities on-the-ground in the FI community. The future of networked knowledge, economic development, and societal engagement is increasingly and inextricably tied to the Internet. The communities, relationships, and exchanges that take place in the socio-economic sphere rely on the necessary technology being developed to extend and enhance the underlying structure of the Internet. The European Commission has funded over a hundred technical projects which are developing aspects of the Future Internet among other initiatives that foster innovation and knowledge transfer. However, for these projects to move from the laboratory into the real world, they must take into account broader socio-economic realities. During this workshop and seminar, experts in FI technology will be engaging with researchers such as social scientists and economists, with policy experts, and with other stakeholders to discuss how the latest technology developments are encountering socio-economic realities. Particular attention will be given to the methods and approaches that facilitate the creation of multidisciplinary networks of collaboration and knowledge exchange. The specific topics will be announced soon, and will be based on the results of a survey currently being circulated to FI projects about socio-economic issues relevant to the realities on-the-ground in the FI community. The agenda and list of speakers will also be announced at that time. The event will offer an opportunity to analyze how to understand the future of the Internet as a platform that can foster innovation, collaboration and knowledge transfer. The results of this event will be written up as a whitepaper, and considered for possible publication.